How pretty is this? Find the "how-to" here...along with many more tasty herbal cookie recipes. 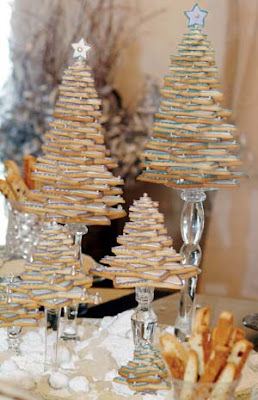 What a beautiful way to display cookies, isn't it? Thank you for sharing this recipe link as I love using herbs in cooking. Oh that is very pretty! Lovely idea, I like it! Thank you! Herbal cookie recipes sound good. Thanks for the link. The chocolate peppermint truffles caught my attention. I've never seen anything like it. And it looks so easy! It's been great looking around your blog this evening. I love all the things that you have gathered for your readers to look at...so pretty and so festive!